This one day course is offered on seleced Saturdays, Mondays and Tuesdays. For those with a formal anchor building class and want to expand their skills to the sharp end. 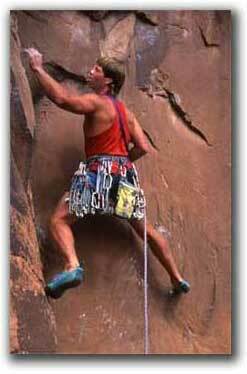 This one day class encompasses an array of traditional (trad climbing) lead climbing skills. The topics include advanced protection placements, racking, multi- directional anchors, use of runners/ slings and cordelettes, reducing rope drag, rope management, proper carabiner orientation and clipping, responsibilities of the leader and second, resting stances, natural hazards and route finding. All lead climbing instruction is done while top-roped, so you can concentrate on learning the techniques. All curriculum is subject to guides discretion. 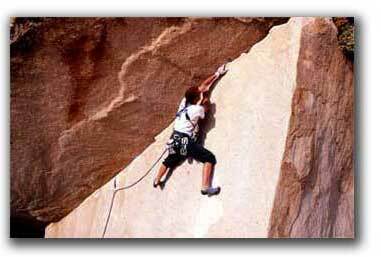 If you're serious about lead climbing, this is for you! Cost: $275 per participant. To make your reservation, Click Here! complete and submit. You will receive a confirmation by Email within 48 hours. Maximum ratio is 3 students to 1 guide. Prices are based on a minimum of two participants. In the event that course participant minimums are not met, options include; rescheduling, receiving a full refund, converting class into "Private Guiding" and paying private guiding rates or shortening the day. Dates are one day "Leading Skills " offered on selected Saturdays and weekdays.